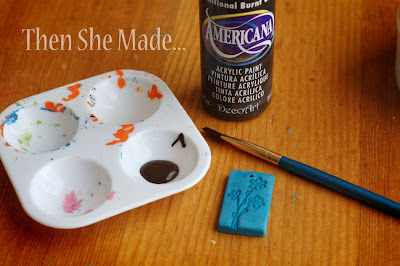 I posted this tutorial over at Broken Treasures about three weeks ago and while I posted a link to it, I never did share it here. Since it's Mother's Day, and if you missed it before, Enjoy! Step 1: Start by picking out a stamp you will use. I used the cute little flowers from the "A Garden" set above. 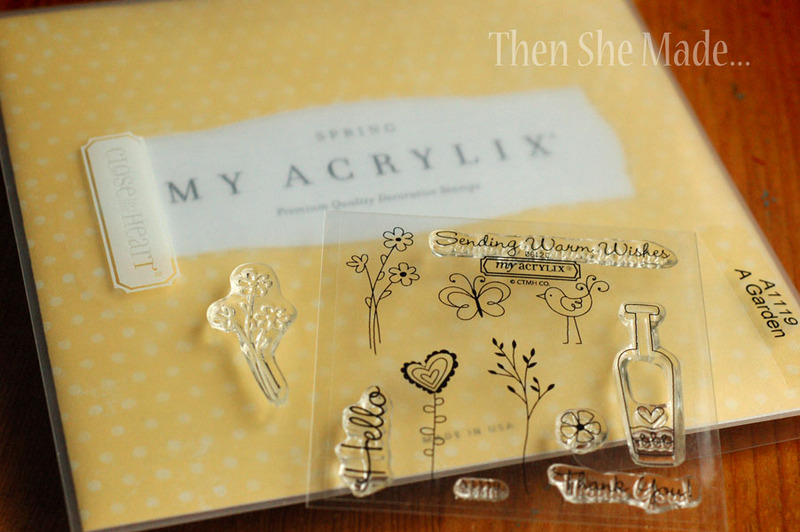 It is a CTMH stamp set. Step 2: Next, pick a clay color. I went with Sculpey Turquoise. There are lots of different oven baked clays out there. Just check your local craft store. Sculpey is my favorite though. Once you've picked your color, break off a small piece and do what is called "conditioning". 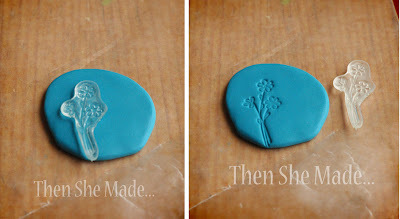 Basically you are just going to knead the clay and play with it for a few minutes to get it soft and workable. Then, press your clay flat like shown above. Kept it's thickness consistent, around 1/4 of an inch. 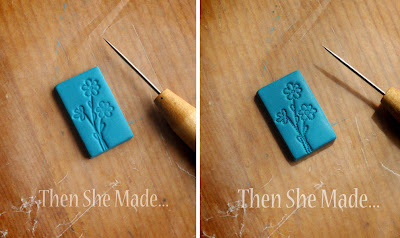 Step 3: Then, take your stamp and press it into the clay. You could use an acrylic block for this but I didn't have one handy so I just used the stamp. 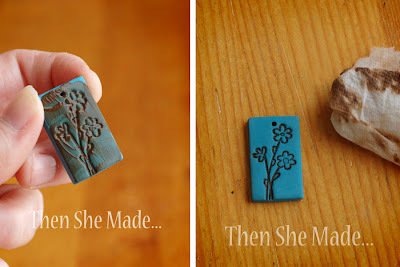 You want your stamp impression to be fairly deep and show well. If it doesn't happen that way the first time, just roll your clay up and start again. 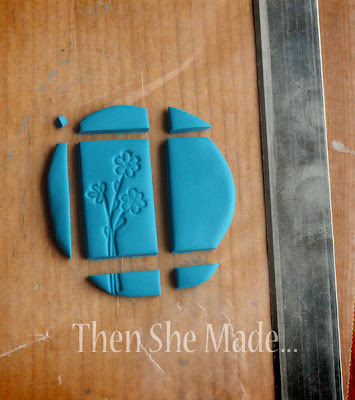 Step 4: Using a cutting tool, cut the clay into the shape you want and remove the extra clay. Step 5: Next, and this is optional, I like to add a little more detail to my stamped impression. So, using a sharp, pointy tool like a needle or toothpick, I basically trace the design by poking small holes in it. Later on in the tutorial we use paint and poking these holes will help your paint settle into your design a little better. Just don't poke them too deep or they will show on the back. Here's a closer up look of the little holes in the design. Step 6: Poke a hole in the center top of your pendant. Don't forget this step, it's an important one. You want the hole big enough so that a jump ring or jewelry bale can fit in it. 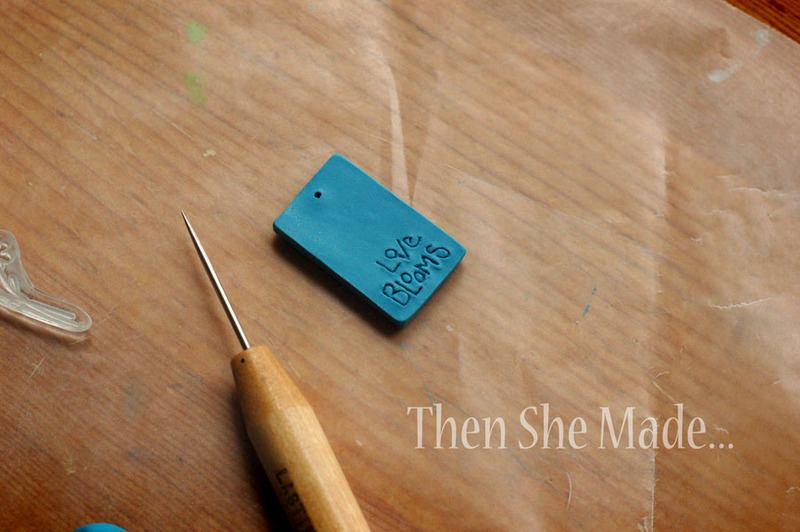 Step 7: Now that the front of your pendant is designed, if you want you can turn it over and add a personal message. I choose "love blooms" and added it by first spelling it out in small dots - kind of like in Step 5, then carefully connect the dots and make lines. Step 8: (not shown) Once you are done, place your completed design on a paper lined cookie sheet. I just use regular, plain printer paper. Then bake in a pre-heated 275 degree oven for 15 minutes. Once it's done baking, remove it from the oven and let it cool completely before moving on to the next step. Step 9: Now we paint. Choose a color that you'd like to go in the design on your pendant. I usually go with a dark brown. You will also want to keep a little water and some paper towels close by. 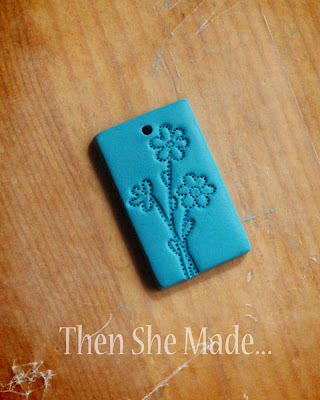 Step 10: Paint your pendant like shown above. Be sure to get paint into the design area. Then, while the paint is still wet, using a dry paper towel, carefully wipe the paint off of the top surface. Don't push the towel into the design, you want the paint to stay there. 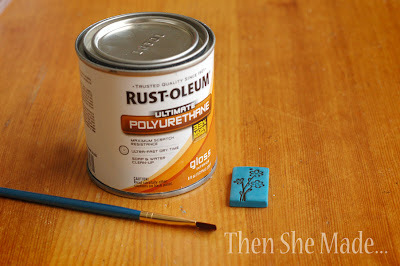 Then, after the majority of the paint is off, dip a paper towel in to water, remove the excess water so it is just barely damp, and clean the pendant up. You want to remove any paint on the top surface that didn't come off when you did the dry wipe. Be sure to check the sides too. 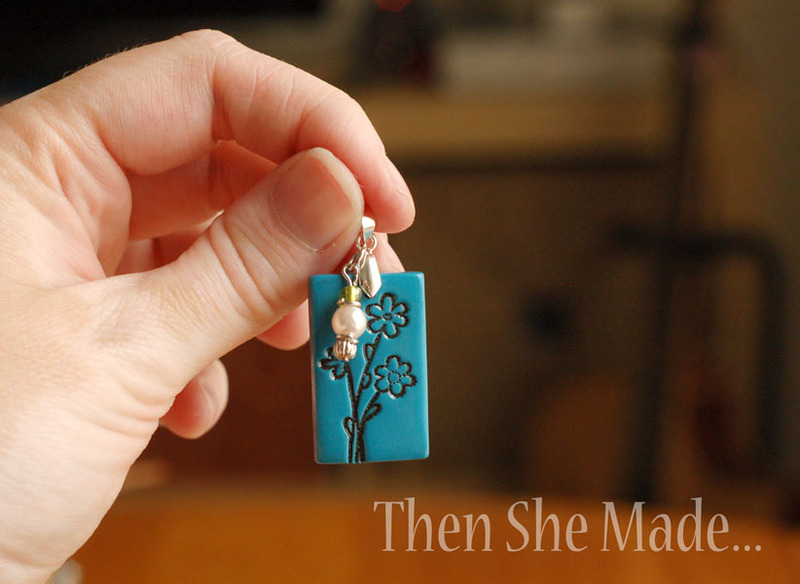 Technically you could end there but I like to give my pendants a finishing touch. Step 11: I use a polyurethane finisher, it needs to be water base and I just paint a thin coat on the pendant and let it dry. Two coats is usually enough. 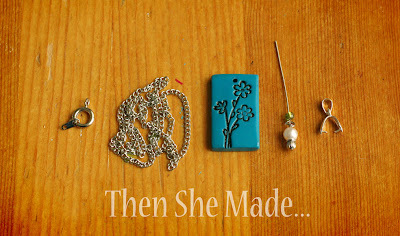 Step 12: After it's dried for several hours, now you can turn it into a necklace. 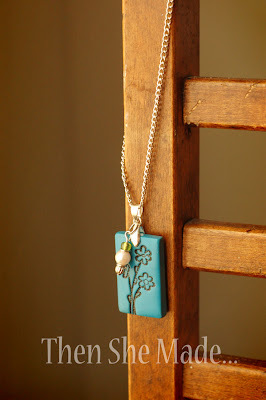 You will need a chain and clasp, a jump ring or bale (I like bales) and enough supplies to make a small dangling charm. Step13: Put the bale on first. If you are new to jewelry making, the bale is the little silver piece that hooks the pendant to the chain (it's pinched in between my fingers in the above photo). Then, hang your charm from the bale. 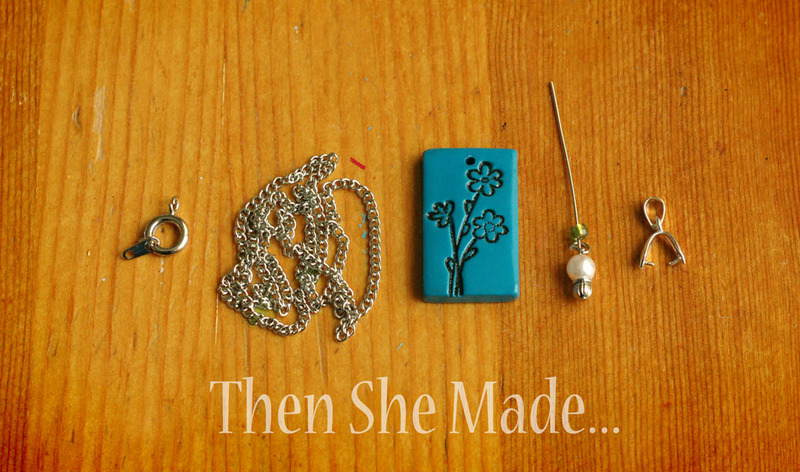 Step 14: Now all you need to do is attach it all to a chain! Beautiful! I am going to have a go at this for my sister. Thank you so much for the tutorial. I LOVE this! And your tute was so great I bet I could do it myself! Love your tutorials, great pictures. why do you bake some of them but not the flower pendant? @Jane, you have to bake all polymer clay. Otherwise it doesn't hardened. It's Step 8 on this tutorial. Usually it bakes for 15 minutes @ 275 degrees. Longer if the clay is thicker. Wonderful tute! Thanks for sharing. BTW did you know that the jewelry bail is spelled "bail" instead of bale? Simplesmente AMEEEEI, seu blog !!!! Suas ideias sao INCRIVEIS !!!!!! Obrigada por compartilhar !!!! !